On the day of election, my dad and mom went with me to E. Rodriguez High School, QC. It took us few minutes to find our precinct. Lots of people waited for their turn to vote. But we’re allowed to immediately vote because of special lane for the special people like me. By checking the internet, I was able to download a sample ballot as my guide in choosing the candidates. I prepared my “kodigo” (list) a day in advance and wrote whom I should vote. Voting time was a fun for me. 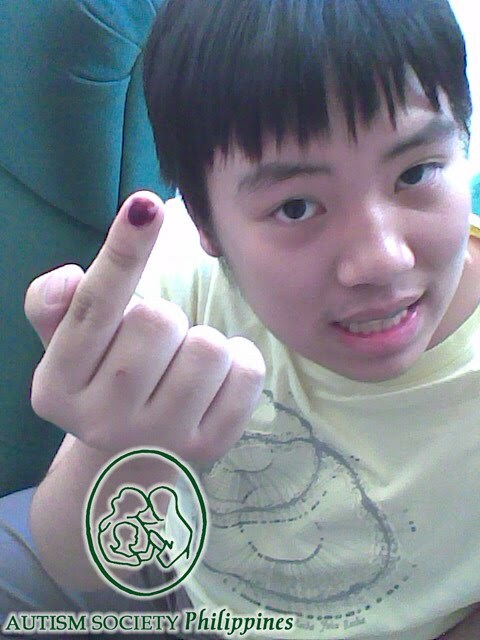 It only took around a minute for me to choose the candidates because the “kodigo” I brought with me inside precinct. It is important to vote because it is a responsibility of every citizen to choose the right leaders. Wrong leaders may lead to many problems like corruptions and crimes. Our country will be weak and there will be more poor people. Bryan Lu is an 18 year old incoming 4th year high school student. He is the lead vocalist and drummer of SPARKLE Band, the latest autism pop teen sensation. Currently Bryan is learning to play the guitar.